I've showed them to you several times at various in-progress stages and until I finished them I was basically putting in 10-15 rows a night and not working on anything else (damn school taking all my knitting time.) I didn't really want to show you a picture every day of my next 10 rows. 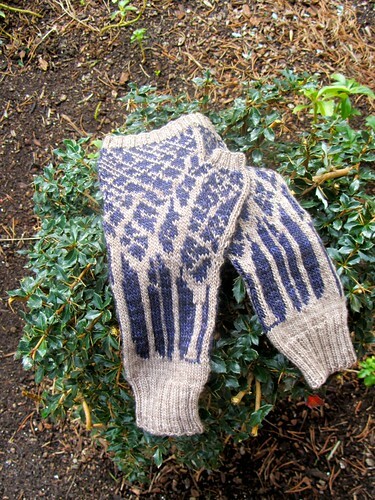 These are Winter Twilight Mitts by Laura Rintala which is a free download through Interweave's Knitting Daily. They are supposed to look like trees (that have lost their leaves) in twilight, but I have had several people tell me that they can't see the trees. The lighter color is the trees and the darker color is the night sky as seen through the trees. I think the problem is that some people are looking for the trees in the negative space. I had a bit of a problem because the pattern assumes that you will use a very dark color for the trees (like black) and a sunset type color for the background (like reddish-purple.) Because of this, the cart for the pattern charts the trees in black and the background in white. Since I was using a light color for my trees and a darker color for my background I had some trouble reading the chart and inverting the color associations in my head. Something to keep in mind if you want to make a version with light trees. The yarn I used is Madelinetosh Tosh Merino Light. I used this yarn for the first time on my shawl from the Westknits Shawl Club Sharktooth. 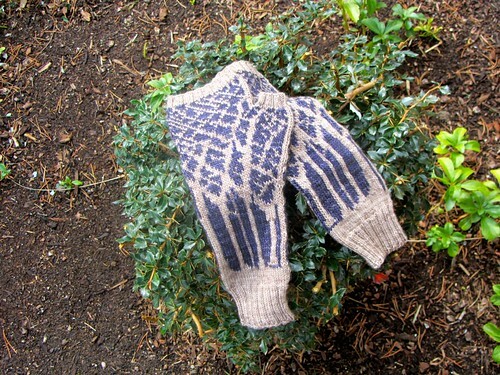 I loved it and ran out and bought some for these mittens so that I would have a chance to knit with it again. The lighter color is Antique Lace and the darker color is Clematis. The colors are so deep and the yarn is so soft. And it's a single-ply and I love working with single-ply yarn. It's jockeying neck and neck with String Theory Caper Sock for the title of "Melanie's Favorite Yarn."